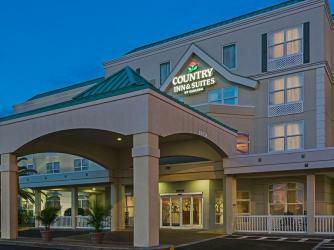 The Country Inn & Suites in Cape Canaveral is the newest and closest hotel to Port Canaveral. Their award-winning staff provides a family-friendly atmosphere certain to delight business and vacation travelers alike. All of the properties 151 rooms are smoke-free, feature complimentary high-speed Internet access, "Did You Forget?" toiletries and come equipped with a microwave, refrigerator and cable TV. The hotel also offers 24-hour no-charge business center (including computer, fax, and copy) and meeting packages, fitness Center, 24-hour snack shop, three heated pools including a waterfall hot tub and dedicated children's pool with fountain. Other Hotel amenities include: shuttle service, children's activities and/or area, coffee maker, cribs, free local calls, free newspapers, gift shop, laundry facilities, meeting facilities and swimming pool. Florida Green Lodging Program The Country Inn & Suites Cape Canaveral has been recognized by the Florida Green Lodging Programs a lodging facility that is committed to conservation. The hotel has implemented environmental practices in areas such as waste reduction, recycling, water conservation, energy efficiency and transportation.